Bushfires are inevitable in the fire-prone landscapes of Western Australia. Long dry summers, flammable vegetation and ignition from lightning or human causes mean that bushfires occur every summer. Engage in geographic fieldwork to examine the impacts of bushfire on the ecosystem and community. Compare the effects of fire on natural and managed areas and consider how topography and land management affect fire behaviour. Discover the difference between bushfires and prescribed burning and why prescribed burns are critical for protecting life, property and the environment. 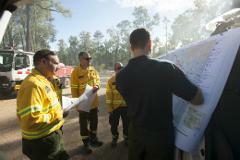 Assess how we can prepare for, and mitigate the effects of bushfire. It is highly recommended that schools undertake the Fire geography package (one-hour incursion before the excursion). The package is designed to prepare the students for the field trip by providing relevant information so we free up as much time as possible for hands-on fieldwork whilst on the excursion ( see "Fire geography package" activity to book this new program).